The model I use for my Dwarf in the Castles & Crusades game I play in. Love this model, tilted the head and re-sculpted the neck, still a WiP but happy so far. 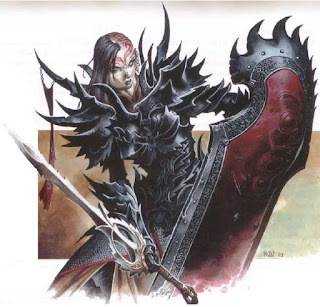 Reaper sculpt that is totally based on this illustration from the 3.5 Complete Warrior. Wanted this model for a long time, very happy to finally have her. Hopefully some more substantial posts soon. Just trying to get back in the habit. Cheers!